Heart Choices: What Are Your Plans for the Summer? What are you doing this summer? I get to spend my summer with lots of children! If you've been wondering where I've been lately, our school's summer camp started immediately. On Friday May 23rd I was saying goodbye to our Pre-K 3 students. And on Saturday and Sunday I was in training for summer camp. I was honored to be chosen as the Site Leader but it comes with more responsibilities. And I take them seriously. After all, I want this summer camp to be FUN and SAFE for the kids and staff. Our first week began the day after Memorial Day. 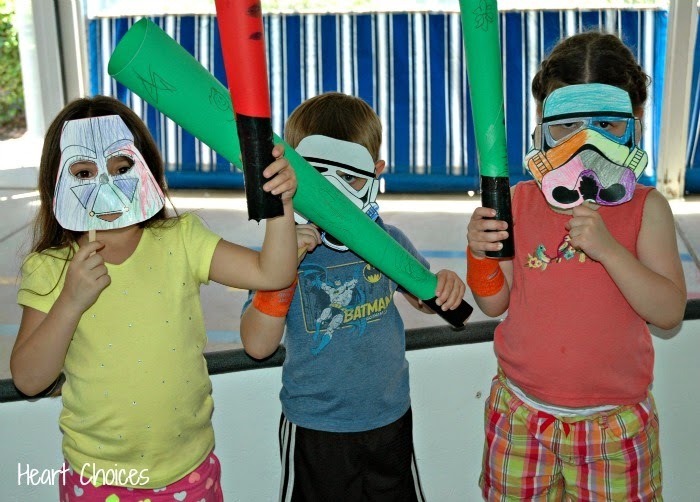 We started with a group of preschool children and the theme was Star Wars. What fun to be Jedi's. We even had a dunk tank and an official mascot. Years ago, I was a graduate assistant for the Dale Carnegie speaking program. We had to demonstrate all kinds of speeches, including extemporaneous talks. I've also attended Tony Robbins and Zig Ziglar conferences. After all, I used to motivate heart patients to make healthier lifestyle choices. What I didn't realize at the time was that I'd be using those skills with little children! I get to take charge of our daily morning Camp meetings which includes singing with a microphone! I'm not much of a singer but ...I have lots of enthusiasm. And the kids don't seem to mind. While I might enjoy a vacation at the beach, instead you can find me singing songs like "Boom Chicka Boom" and "Great Big Moose". Hi Debbie! I have to ask...who's in the dunk tank? Was it you?? Sounds like so much fun! And you are just the right person to lead it. You have concern not only for fun, but for safety. With that many children, those are really good concerns! Sounds fun. I don't have any real plans yet but I do intend to clean my house. I think that's really a big help to teach about heart from the younger years and help them be motivated to always choose for what's best for health. Another is that keeping young minds busy no matter what season helps them or prevents them from having idle minds. Sounds busy but a lot of fun for your summer and what wise choice to spend it encouraging or ministering others. I'll still be working but having more time with my family. To me...it's always an instant vacation when we are spending time together. Have a fun and safe summer sister. Always be strong in the Lord's mighty power! But, that is not what I wanted to comment on.......you know Debbie, life didn't turn out exactly how we dreamed.........you care for little children, I have invested these last years into raising my (grand)son. We hear others talking about trips and leisurely lunches, and yes, that would be fun. But when it is all said and done, will it be better that we talk of yet another trip to Hawaii or France, the days that although fun, didn't really impact much of anyone - or, will our real meaning come from the young lives we have touched, molded and yes, sacrificed for? WE still get to have some fun, take a trip here and there, enjoy outings with friends (we need one! ), but knowing that you impacted a child (or just another life) in some way, is such a privilege........may not always feel that way, but I truly believe we are blessed to pour ourselves into these precious ones. I know you love the children, and I know you give 110% to all you do, and I know for sure, these children are blessed to have a woman of faith, who loves them and genuinely cares about their welfare and their little souls. I don't really have a lot planned for the summer. Now that I'm retired, I have a lot of time on my hands. I am going to be helping out in our church's VBS this month. Hubby and I may go camping next month but nothing definite yet. This just warms my heart and makes me smile! You go girl! We just got finished with school today and I will be juggling work and time with Benjamin this summer. Vacation..don't know that we will have one, but we sure can do some fun things around here. Intentional will be my summer theme again...intentionally finding ways to enjoy summer.